The ACR33U-A1 SmartDuo SDK is a complete package containing all the vital components required for the development of smart card applications. 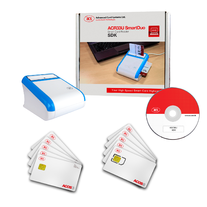 The ACR33U-A1 SmartDuo SDK provides developers with tools and utilities and sample codes, which enable the convenient and effective incorporation of smart cards into their solutions. The development kit is priced at only US$119. This SDK supports in both English and Chinese languages.